The Queen Palm is designed for all commercial uses. It has a weight of 67 lbs. A reinforced truss bar means this canopy will stand up to the most punishing environments. The Queen Palm builds upon our top selling Classic Palm. With a rectangular truss bar, the Queen Palm is built to last. The Queen Palm is the choice for the vendor or grocer who needs a canopy that will withstand regular daily use. More and more states are adopting California's strict fire safety standards applicable to vendors using canopies/tents for public events such fairs, farmers markets, carnivals, parades and other similar events. 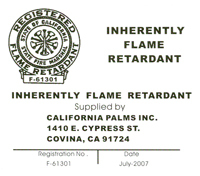 In most counties throughout California, vendors are required to use flame retardant canopies. California Palms Inc. is proud to be one of the distributors of flame retardant canopies, and one of the select, few distributors that have the Fire Marshall's approval for Multi-Color Flame Retardant Canopies. Full Set Comes with Canopy Bag.